Kerala is a lush green land and the home to several cash crops like coconut, tea, rubber, coffee and spices. These are pictures of the picturesque rubber plantations. These were first planted here by the Dutch as Rubber is not native to India. These tall slim trees are now a major revenue earner for the state of Kerala, India. Plastic pouches are on the trees to collect the sticky white latex, the milk of rubber. Processing yields natural rubber. 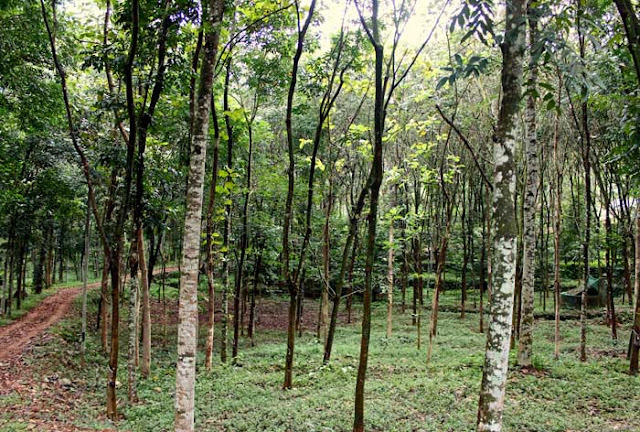 Rubber trees are tall with straight trunks and smooth green leaves.